OH RIGHT. ALERTING CHILD PROTECTIVE SERVICES. this is tantamount to child abuse. 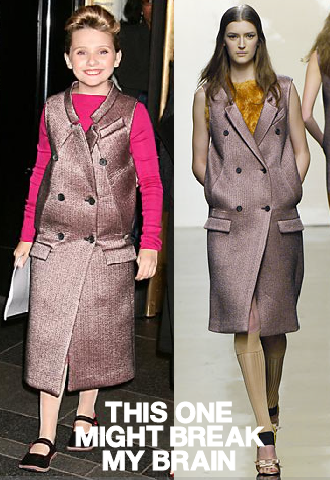 PRADA FALL 07 is NOT for CHILDREN. the 'internet movie database' informs me that miss abigail breslin is eleven years old. ELEVEN. the collection that ms prada presented for fall of 2007 was a seriously wacked out proposal of fur tunics and plastic coated wool and really it is only to be used by those people who are ADVANCED in FASHIONOLOGY. not a CHILD in buster brown MARY JANES. EQUALLY OFFENSIVE: her hair and makeup. she looks like margaret thatcher. that's it; i'm calling 311.